New Month -- New Color! I'm always so excited for new months. Not that I don't love neutrals, but they just aren't quite as zippy as orange in my opinion. 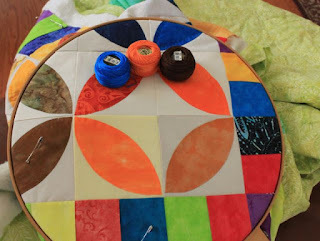 Maybe I will finish the quilting on my Orange Peel Quilt this month? Hopefully I'll be able to put some of these orange scraps to good use. With a three day weekend to look forward to, I'm sure to make excellent progress. The 9 Carat Diamond Flimsy is done! 1 inner striped border along with a diamond print border. This is the third quilt I've made with leader and ender nine patches. I wonder what pattern will come next? 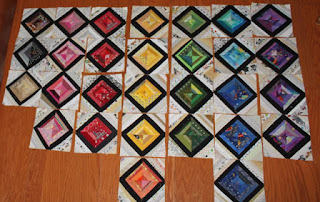 I think I'll shift to 16 patches for a bit first, the 2.5 in squares have started to pile up. It is much fun to see what scraps can turn into with a little love. Head over to Oh Scrap! to check out other scrap busting creations. I could not resist this fabric when I found it in the clearance bin. 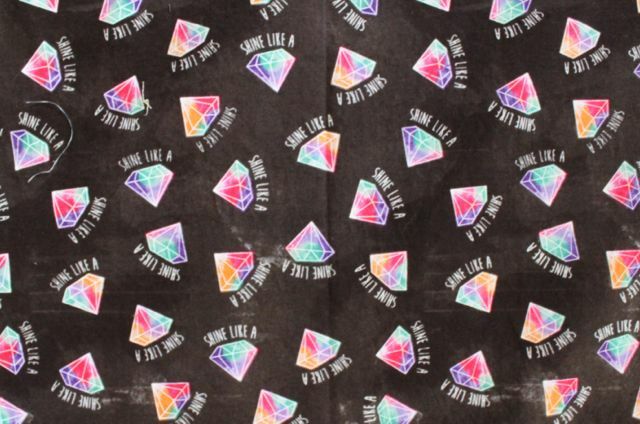 It says shine like a diamond. 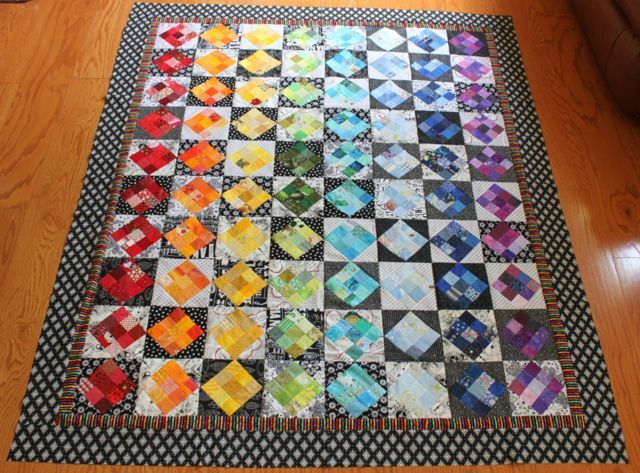 Seemed just too perfect for this quilt. I should have bought just a bit more though. 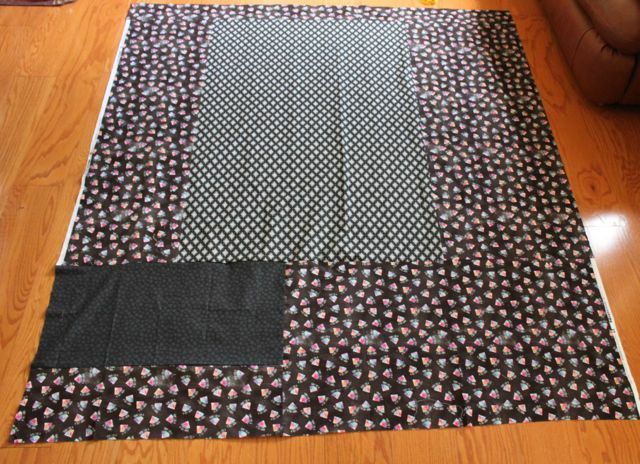 I had to toss in a random square of black fabric to stretch it all out. I guess I could have worked out the math ahead of time, but it all works out one way or another in the end. I've folded it all up for now, but it is ready the next time I get an urge to quilt. For now I have essays calling my name. The down side of having more AP students this year is more essays to grade. 40 students times 4 essays each on the last test. I'd better get busy! I ran this morning, but fortunately it was a fall back week of only 3 miles. While going out for a morning jog on Thursday I tripped on the sidewalk and took quite a tumble. What can I say, I've got grace and skill! Knee, hand and shoulder will all heal, and it was easy to have a new screen installed on my phone. Bending and kneeling to finish up the borders and backing was quite a trick though. Those essays are sounding better all the time. The neutral month is nearing the end. Hopefully you are clearing out a few low volume scraps. 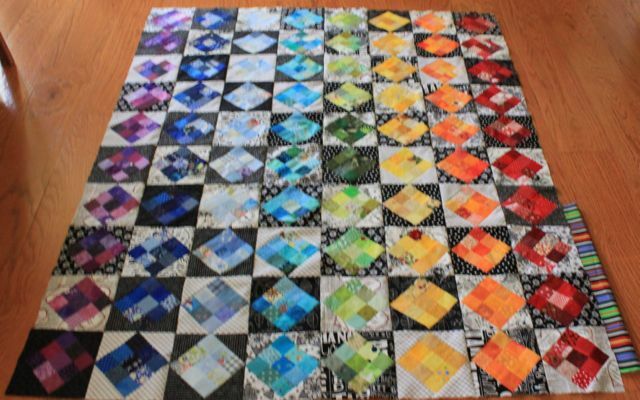 I am almost ready to finish a Rainbow quilt which has been in progress for a while now. I went out last weekend and picked up a few fabrics for borders and backing. Now it is just a matter of getting it all put together and finished off. What scrappy fun have you been up to? Misterlinky is ready and waiting for your weekly report. I'll be watching the weather while I sew, hoping for the best for everybody in Texas. Its been a while since anything this big has hit. I hope everyone is ready or that they went somewhere safe to wait it out. I'm so close to being done with the center blocks for the orange peel blocks. I think it is just this teal block and then two in browns. Then border decisions will follow. I also made good progress on the strings yesterday. I was curious about whether I would be able to get enough contrast with just neutrals to still see the pattern. I think that it will work. 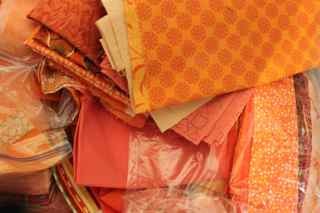 Then I made a trek out to get some background and border fabrics for Nine Carat Diamonds. More details to come, but I think it will be fabulous. 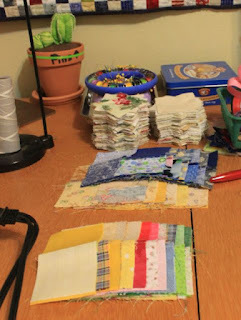 There is still a bit of schoolwork to be done before Monday, along with more laundry, but there should still be some time for a bit of hand quilting and maybe even a string block or two before the day is done. I'm linking up with Slow Stitching Sunday and Oh Scrap! today. Be sure to make a visit before your day gets underway. I'm off to run 8 miles this morning, but will update as soon as I am home again. First full week of school is done and all is well. OK, home again after a morning run. All showered and ready to start the day! I finished putting the blocks together for Nine Carat Diamonds on Sunday. 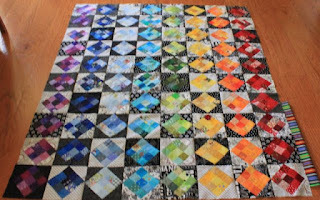 I'm pondering a thin rainbow striped inner border and then a wider outer border of black and white or maybe something in charcoal grey? Being done with nine patch leaders and enders for a bit, it seemed like a good time to switch gears. 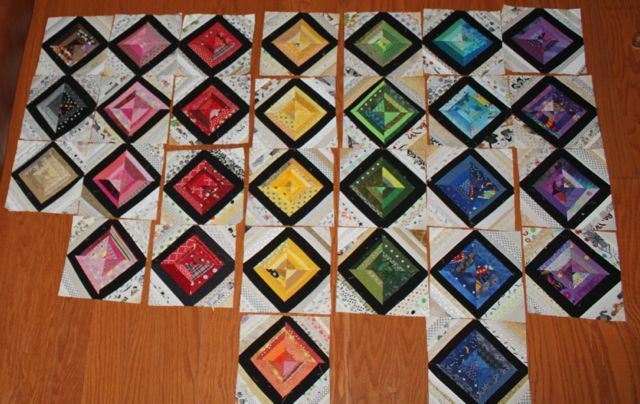 I have a ton of four patches made from 2.5 inch squares hanging around. Those are now in the process of getting turned into 16 patches. A few neutral squares have already started to work their way through the process. While in organizational mode, it seemed like a good time to get some more leaders and enders ready to go. Now I just have to decide which main project to get back to work on while these extra blocks wait patiently. How are your neutral fabrics coming along? Misterlinky awaits! I need just one more row of nine patches on point to finish up this quilt. The green nine patches are already made, they just need to be framed and I can sew the rows together. Nine patches are so versatile! 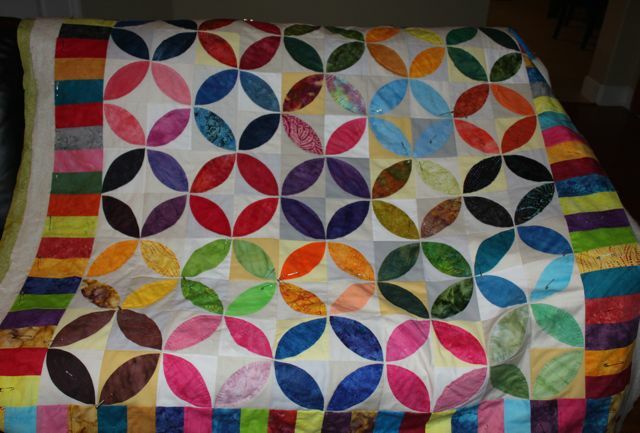 This quilt was to use up leftover nine patches from something else. 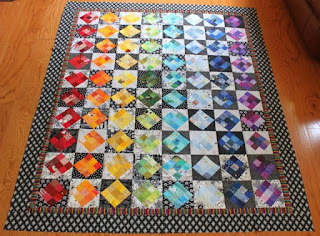 I wonder what I will do with the leftovers from this quilt? There are always leftovers. Always. It is awfully nice to have a weekend already after only 2 days of school. It almost feels like summer again. Except of course for that thought in the back of my mind that I'd better try to remember what I'm teaching on Monday. The freshmen are taking a pretest. That will give me a bit of time to do the first grading of the new year. The AP kids need to actually learn something though. I'd better do something about that before the end of the day. Still plenty of hours left in the weekend though. I plan to enjoy all of them! While dropping off Ryan yesterday afternoon, I was able to pop into Jo-ann's to pick up teal and brown thread. I had tried Michael's in the morning when I was up north at the gym, but they only had a few colors. Joann's had only size 8 in the brighter colors, but it will work well enough I'm sure, even though I was using size 12. There doesn't seem to be too much difference. Just a few more blocks until I can move on to the border! I think I will do something slightly wavy with gray thread. Maybe an orange peel shape with the points on the seams between the colors? 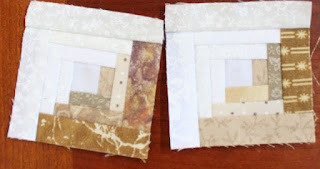 I'm linking up with Kathy for Slow Stitching Sunday as well as Cindy for Oh Scrap!. Be sure to visit for some hand quilting inspiration and scrap busting ideas. Nobody seems to feel neutral about the neutral month. Hopefully you are using the opportunity to get some scraps put together though. I found this huge stack of neutrals hanging out in my sewing room waiting for a little attention. The fact that this giant pile of fabric could be hiding unnoticed tells you a little about the state of me studio. I have been trying to collect a more diverse array of neutrals. Now the trick is to put them to use. That should be the fun part though. 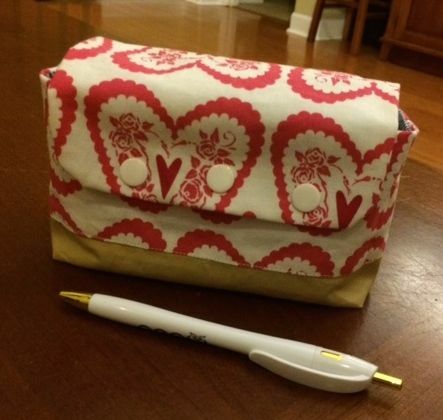 Anna asked me to make her a pencil pouch before school started. Just in time for the first day, I finally whipped one up for her. I think that everything is set for the morning. First days are always so exciting! I was sure I wouldn't have enough colors of thread when I started hand quilting the orange peel quilt. So I found some at Connecting Threads and hit order. In hindsight, I should have waited until I was a little further along. Lavender is pretty close to grey, and a then I found a spool of pink hiding in the thread basket. 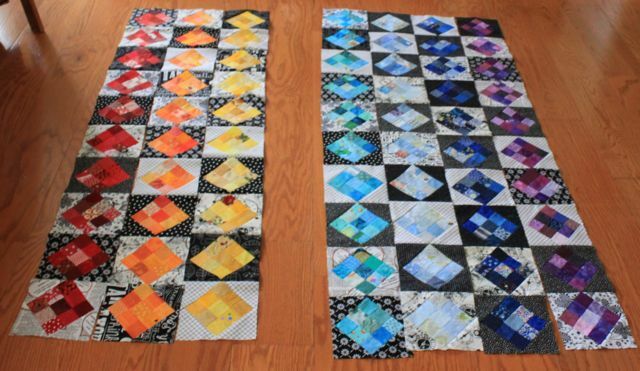 Before long, all the blocks were quilted except orange, brown and teal. Then yesterday, my thread order came in. Orange is good, but how can there be no teal or brown in all of this? 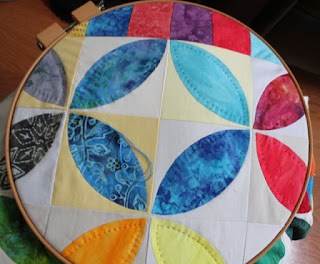 Fortunately, I'm really enjoying quilting with the pearl cotton, so I'll line up the circle quilt to be ready for next on the list. I'm sure of all these colors will come in handy then. 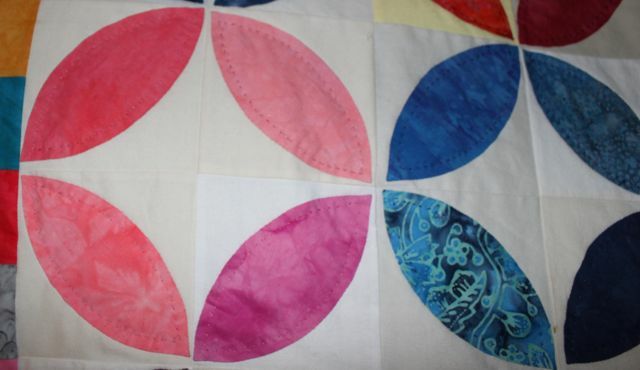 No rush though, isn't that all part of the point with hand quilting? I'm enjoying each block as it comes and continuing to ponder the border. I hope that you are finding some time to enjoy your Sunday. 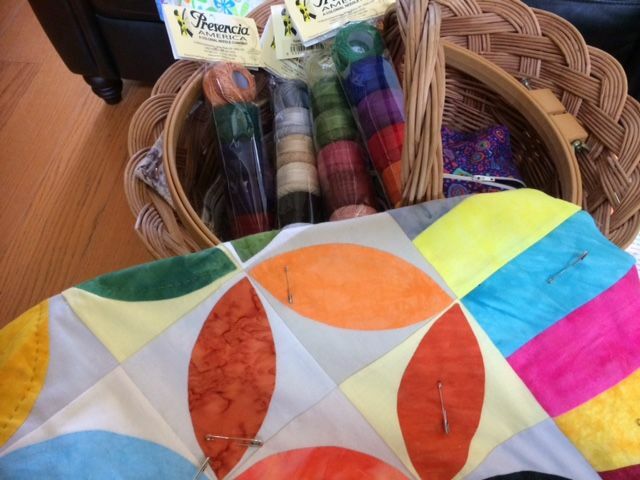 Why not head over to see what slow stitching other quilters are up to at Kathy's Quilts? Sometimes the light colors can feel a little left out of the rainbow fun. So every so often, it is nice to give them a chance to come out and play. This month will be all about trying to use up the light neutral scraps that you just haven't been able to rid of in a while. It is a new month, that means a new color! I was so carried away with the storm that wasn't, I almost forgot. For August, we are going to be working with the light neutrals. Cream, ivory, mixed backgrounds. You get the idea. Try to expand your range from snowy white to paper bag beige. This is also a chance to get rid of light pastels that don't blend will with your main color scraps. If you lights won't work with your blocks, feel free to take a catch up month. I know a lot of us could work on blue for years and years. Don't skip it because you are scared though. It is fun to play with contrast to get odd ball neutrals to work together with enough contrast so that the pattern shows up. If worst comes to work, you can always make a few placemats or potholders. Emily totally fell apart before it reached this side of the state. It was windier this afternoon than it ever was as the remnants of the storm passed overnight. Best of all, our roof got fixed today, so we will be ready if we really do get a storm. There was a small leak over the garage, but it is all better now. 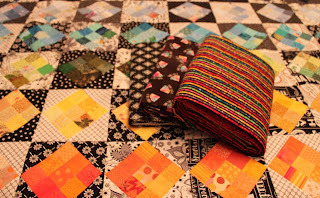 While I was waiting on the roofers, I was quilting away on my Orange Peel blocks. Pearle cotton with big stitches goes to super quick! I finished off all the blocks for which I could find a suitable color of thread. 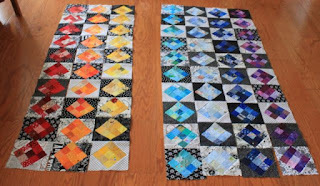 I don't seem to have anything in orange or aqua, so those blocks are on hold until my order comes in from Connecting threads. Probably for the best though, my fingers are sore from too much hand quilting. Now they will have a chance to rest up a bit while the order is in the mail. While I am waiting, I need to decide what to do with the border. Changing colors for each of the piano keys might be a bit much. Something in a neutral perhaps. Tomorrow is the first day back to school for teachers. I was in today trying to get a head start on things. Everyone will be back tomorrow for lots of meetings and frantic getting ready. For now I'll take a deep breath and enjoy the last few hours of vacation.